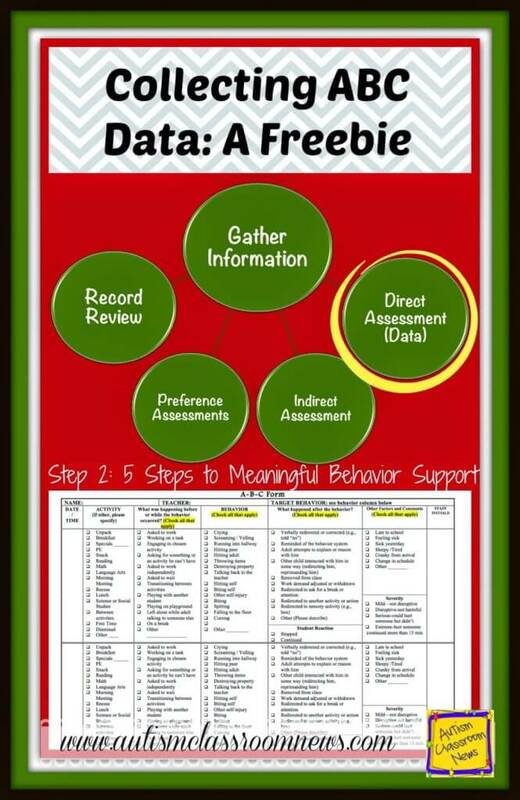 ABC data, or antecedent-behavior-consequence data is critical to the process of a functional behavior assessment. The more clear and comprehensive the information collected the better able we are to draw conclusions about the potential functions. However, the hard part is trying to collect comprehensive while not having it interfere with addressing the behavior, assuring safety, and, you know, little things like…instruction. So today I wanted to share an ABC data sheet that I use to try to get specific information easily. To see more posts in this series, click HERE. For those who are not familiar ABC data, it stands for Antecedent-Behavior-Consequence data. 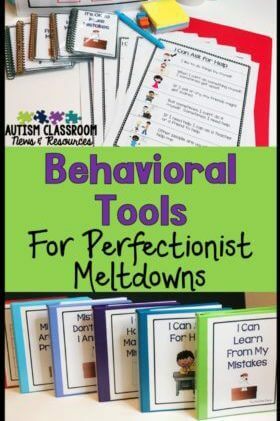 ABC data comprises the most useful type of naturalistic data we can collect to help determine the function of challenging behavior. As a quick primer, we try to determine what is happening in the environment before a behavioral issue arises (antecedent) and we want to know what happens after the behavior happens (consequence). We collect it to try to understand the context of the behavior and how the environment and the behavior interact. It doesn’t give us a clear cause of the behavior, but it does help us determine if there might be a relationship between the behavior and what happens before and after the behavior. The more we know about the situation, the more we can find patterns. The data sheet I want to share is a check-off sheet I use to try to gather complete information without having the write a whole journal entry to record it. 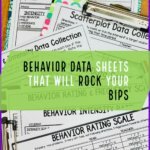 The freebie is not editable, but I plan to put together a group of data sheets for behavioral support that will include an editable version. 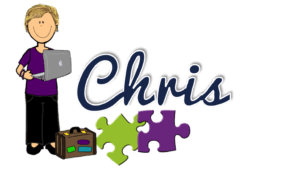 I often will individualize it based on what I know about the student as needed. Let me explain a little about the different elements about it and in my next post I’ll talk about some things to think about with the different elements. 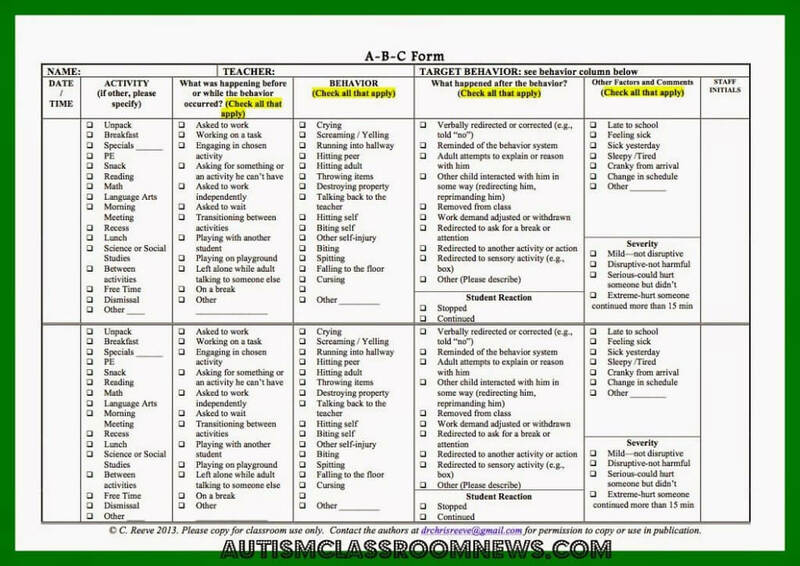 You’ll see that the target behavior says see the behavior column because the behavior checklist has a variety of behaviors to choose from. In the activity column, there are a variety of common scheduled activities from school days. There is an “other” choice in each column so you can always write something in. In the antecedent column, record everything and anything you see that happened before or as the behavior was occurring. You can check more than one. We often think of antecedents as “triggers” for behavior. But it’s important to remember that we are taking data because we don’t know what the triggers are. If we only record what we think is related to the behavior, we may be missing things that show us a pattern later. The same is true for consequences. We tend to think of consequences as something we purposely do to discipline a student. However, in this case consequence means simply something that happens after the behavior occurs. It might be something we (the teacher) do on purpose. 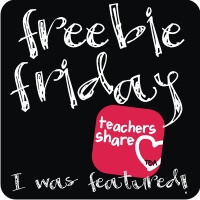 It could also easily be something that the peers do in reaction to the behavior, the reaction of others in the hallway, or simply redirecting the student to engage in appropriate behavior. Again, the more information we have, the more likely we are to find patterns when we look at the data. This data sheet has 3 sections on it that you don’t always see on data sheets for behavior. The first is the student’s reaction to what happened in the environment after the behavior. If the behavior stopped, then the consequence might be reinforcing for it. If it doesn’t, then it might tell us that the consequence and behavior are not related or that the consequence, like redirection, wasn’t effective. 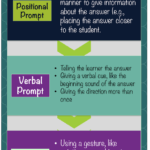 This can be useful when we develop interventions later. The second section is one that asks about other factors. These are issues that try to get at whether there are more distant events that might affect whether the individual is more likely to show behavior problems that day than others. Essentially it’s trying to get at what we call setting events. Setting events are events that make behaviors more likely to occur when an antecedent occurs. They are the reason why some days the behaviors don’t occur in response to an antecedent and other days they do. I’ve listed some of the common ones like illness, lack of sleep, and changes to the daily routine or schedule. I’ll talk more about setting events in a post of their own because they are often overlooked. Finally the third section just tries to get at the severity of the challenging behavior. This gives us the opportunity to track whether the behavior is more or less severe over time. It also can help us figure out how to prioritize the behaviors we want to address. It’s not a scientific scale, but it can be helpful with the same person using the ratings as an estimate. So, while this won’t eliminate the need for training people to take data accurately in the classroom, it can provide a quick way to record the most information and still keep things running in the classroom. Click the picture above or HERE to download the pdf file of the data sheet. I’ll pick up the next post with more thoughts about ABC data collection. 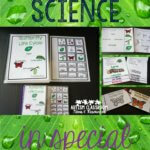 In the meantime check out more freebies at the linkies below and if you have elements you would like included in the ABC data sheet when I put it together in a packet for TPT, please share them in the comments. This form is awesome! Did you ever make an editable version?